Tamil Nadu receives the second highest number of tourists among Indian states, mostly domestic tourists. 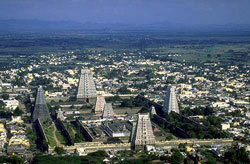 Partly that's because of its temples, famous for their monumental towers at the temple's entrance (Gopurams). Also because of the state's many hill stations, nature reserves devoted to elephants, tigers, and birds, and zoos; national parks, crocodile farms, and an important mangrove forest. Along the long stretch of beaches from Chennai to Mahabalipuram can also be found many resorts, restaurants, and amusement parks. Notable temples include the Chola-built Brihadishware Temple in Thanjavur, the Airavateswara temple in Darasuram and the Shore Temple (these last two are UNESCO World Heritage Sites along with the monuments of Mahabalipuram). Madurai has one of the world's grandest Hindu temples�Madurai Meenakshi Amman Temple. Important Hindu pilgrimage sites include Rameshwaram, Kanchipuram and Palani. Tamil Nadu's climate ranges from dry sub-humid to semi-arid. Chennai, formerly known as Madras (pop: 8 million) is a vibrant, crowded coastal city.�Chennai was under the British for 350 years. Yet it has largely retained its traditional Tamil Hindu character. Chennai is also an important sea port, and a major Indian centre of trade. Not bad, for a city that started in the 17th century as a tiny fishing village. A major Indian film industry called Kollywood has its headquarters here, so movie soundtracks are heard throughout the city. Chennai also has renowned sports venues, regularly hosting a major tennis event, the Chennai Open. It is also a centre of theatre and Indian classical dance. Chennai has a hot and humid climate. It has heavy traffic, air pollution, and a water shortage.